Why would we rather justify our bad deeds than apologize for them? Social psychologist Carol Tavris has just written a great essay on the "design flaws" in our brains that cause us to lie to ourselves about horrific mistakes we've made — and then make them again. Decades after Isaac Asimov imagined that psychohistory would save civilization, we have finally begun to see how useful his idea can be. Tavris has joined history with cognitive science to explore why history is "a march of folly," where we make the same bloody mistakes over and over again. History has gotten into bed with psychological science, and it's a happy match. History gives us the data of, in Barbara Tuchman's splendid words, our march of folly — repeated examples of human beings unable and unwilling to learn from mistakes, let alone to admit them. Cognitive science shows us why. Its evidence has put a stake through the heart of any remaining arrogance we might have as a species that we are Homo "sapiens." Our brains, which have allowed us to travel into outer space, have a whole bunch of design flaws, which is why we have so much breathtaking bumbling here on Earth. Of the many built-in biases in human thought, three have perhaps the greatest consequences for our own history and that of nations: the belief that we see things as they really are, rather than as we wish them to be; the belief that we are better, kinder, smarter, and more ethical than average; and the confirmation bias, which sees to it that we notice, remember, and accept information that confirms our beliefs — and overlook, forget, and discount information that disconfirms our beliefs. The great motivational theory that accommodates all of these biases is cognitive dissonance, developed by Leon Festinger in 1957 and further refined and transformed into a theory of self-justification by his student (and later my coauthor and friend) Elliot Aronson. The need to reduce dissonance is the key mechanism that underlies the reluctance to be wrong, to change our minds, to admit serious mistakes, and to be unwilling to accept unwelcome information. Cognitive dissonance is the discomfort we feel when two cognitions, or cognition and behavior, contradict each other: the classic example being "Smoking is bad for me" versus "I'm a heavy smoker." In his elegant and counterintuitive experiments, Festinger showed that like extreme hunger, dissonance is uncomfortable, and like hunger, we are motivated to reduce it. Smokers either have to quit — or justify smoking. In the last fifty years, dissonance theory has been supported by more than 3,000 experiments in cognitive and social psychology and neuroscience. But Elliot took that theory to another level, showing that the need to reduce dissonance is greatest when the disconfirming, unwelcome evidence disputes how we see ourselves, challenges a central belief, or questions a story we have woven to explain our lives. When we do something that is inconsistent with our view of ourselves, we can reduce dissonance by changing our self-concept ("I guess I'm not as ethical as I thought I was") or by justifying what we did. This kind of self-justification is not the same thing as intentionally lying to others when we are caught doing something illegal or unethical, to avoid punishment, fines, or jail. Dissonance reduction is a largely unconscious mechanism that allows us to lie to ourselves. Because most people see themselves as competent, ethical, smart, and kind, their efforts at reducing dissonance will be designed to preserve their positive self-images. "I'm wise; you're telling me my decision was foolish?" "I'm kind; you're telling me I hurt you? You must have deserved it. In fact, you started it!" The greater the dissonance between who we are and the mistake we made or the cruelty we committed, the greater the need to justify the mistake, the crime, the villainy, instead of admitting and rectifying it. We can do it, of course; some great military and political leaders have done so. After the disastrous bloodbath of Pickett's Charge at the Battle of Gettysburg, in which more than half of his 12,500 men were slaughtered by Union soldiers, Robert E. Lee said: "All this has been my fault. I asked more of my men than should have been asked of them." But the Robert E. Lees are rare. 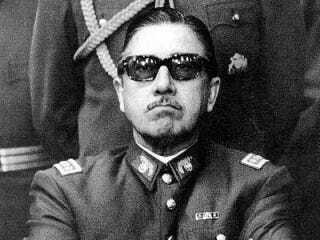 More of history's leaders are like Augusto Pinochet, who, when an interviewer asked him how he could sleep at night given the evidence of his greed, corruption, and crimes against humanity, replied: "One always sees oneself as an angel." One does. Read the rest of this article over at History News Network, or check out Tavris' book on the same topic.